Patellar instability normally occurs secondary to a combination of associated factors. Normally there is an underlying abnormality in the shape of the patellofemoral joint (lateral patellar maltracking and/or patellofemoral dysplasia). There is also normally an initial traumatic event, such as a twisting injury to the knee or something like a bad football tackle. If the patella ‘pops out’ (to the outer/lateral side of the knee) fully, then this is called ‘patellar dislocation’. If it pops out only partially, this is called a ‘subluxation’. Often, a patellar dislocation may reduce itself back into place spontaneously. Otherwise, if not, then the kneecap may need to be manipulated back into place under ‘gas and air’, either by ambulance crew or potentially in an A&E Department. After even just 1 single episode of patellar dislocation, the tissues around the inner side of the knee that help hold the patella in place (the medial retinaculum and the medial patellofemoral ligament) are torn, and these rarely ever heal up properly, which leaves residual ‘weakness’. The more times a patellar dislocates, the more likely it is that there will be repeat episodes of further dislocation. Every time a patella dislocates, there is potential articular cartilage damage being caused in the knee to the back of the kneecap and the front of the knee, and this can end up causing arthritis. Recurrent patellar instability more often than not ends up needing to be treated surgically, with a surgical patellar stabilisation procedure. Patellar instability is a difficult and complicated subject. It normally occurs through specific trauma, from twisting on a bent knee, but there are often very specific (and sometimes multiple) underlying reasons why the patella was potentially unstable and vulnerable to potential dislocation anyway. 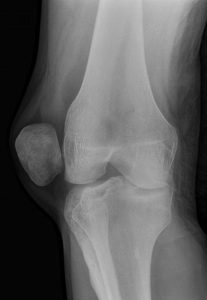 When a patient says that their knee dislocated, they are normally referring to a dislocation of their patella (a proper ‘knee dislocation’ is a massive, severe, potentially limb threatening injury where most of the ligaments in the knee tear and the tibia dislocates away from the femur, and this is a surgical emergency). The patella is often felt or seen to ‘pop out’ over to the lateral (outer) side of the knee (inner/medial patellar dislocation is almost impossible without there having been major direct trauma and significant fractures in the knee). The patella may ‘pop back in spontaneously’ on its own, or the patellar dislocation may be reduced pitch side by a physio or in an ambulance, by a paramedic. However, if the patella remains dislocated then it often ends up having to be reduced in the A&E Department by a doctor, under mild sedation and with pain relief from ‘gas and air’ (nitrous oxide). Some patients may present not with an overt patellar dislocation, but instead with intermittent episodes of patellar subluxation, where the kneecap feels unstable and where it partly/nearly dislocates, but not fully. 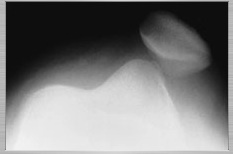 X-rays showing patellar dislocation (patellar skyline view). X-rays showing patellar dislocation (AP view). Patellar instability/dislocation is very often associated with damage to the articular cartilage in the patellofemoral joint. Also, the first time a patella dislocates there is normally a complete tear of the stabilizing tissues on the inner side of the knee, namely the medial retinaculum and the medial patellofemoral ligament. Once damaged, these structures tend never to heal up fully and are there always thinned, stretched and weak, increasing the risk of further subsequent dislocations. The more times a patella dislocates, the more likely it is that there will be increased laxity of the structures, increased instability and further subsequent dislocations, and every time a patella dislocates, the more damage and wear and tear there will be to the articular cartilage covering the patellofemoral joint surfaces, and hence the bigger the long-term risk of patellofemoral arthritis in the knee. The first step in investigating potential patellar instability is to confirm what actual damage there might be in the knee joint from any patellar dislocations. The next step, which is vital, is to check exactly what potential underlying issues there might be in the knee, which may have predisposed the knee to suffering patellar instability. Patellar instability can often simply be considered as an extreme form of lateral patellar maltracking, but with a deficient medial retinaculum and medial patellofemoral ligament. Early treatment of a patellar dislocation normally consists of resting the knee and protecting it with a brace, to prevent knee flexion (bending). When the knee is kept straight the patella tends to be stable, and potential dislocation of the patellar normally only happens as the knee starts to bend, particularly at about 20 to 30 degrees of knee flexion. It might, therefore, be necessary to keep the knee joint splinted straight for a full 6 weeks prior to then getting things going with physiotherapy rehab treatments. If with rehab the patient is able to achieve a good outcome, without any further patellar dislocations, then they may be able to avoid any kind of surgery. If there is specific damage inside the knee joint (particularly to the articular cartilage covering the patellofemoral joint surfaces) then a knee arthroscopy might be necessary in order to tidy this up. If a patient has had multiple previous patellar dislocations, or if they go on to suffer ongoing patellar instability despite appropriate physiotherapy rehab after a first time patellar dislocation, then it is likely that they will probably need a surgical patellar stabilization. This is often very similar indeed to (or actually the same as) the surgical treatment to correct lateral patellar maltracking.